'PUTTING ON THE RITZ' DRAWING CHALLENGE! This month folks we have a 'competition within a competition'. 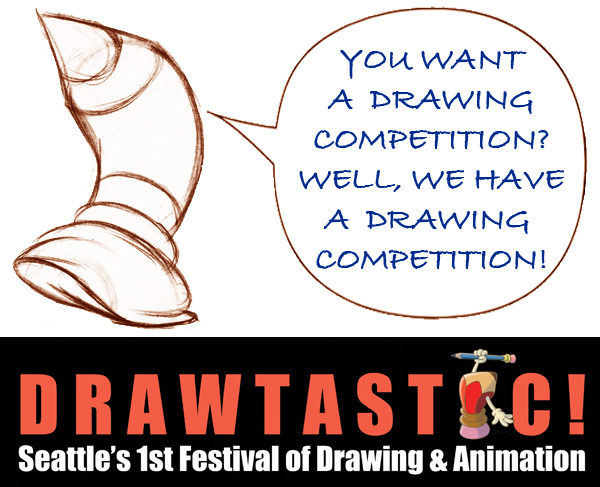 On April 30th in Seattle we are holding our inaugural 'DRAWTASTIC' Festival of Drawing and Animation. The event has so many goodies attached to it but one of the things that might interest you is that there's a dedicated drawing competition ~ with a special category reserved just for Sketchclub members!. So this month I want everyone to have a crack at this challenge - which is to create a drawing (making it as 'animated' as you can of course) that i) celebrates, ii) pays homage to or iii) generally has fun with an image of the 'humble pencil'. So draw anything you like folks but it has to either feature a pencil, show an environment with a pencil in it or simply have another character respectfully using a pencil as a prop. The winner of this month's challenge will not only have their work featured in exhibition at the festival - along with the other finalists' drawings - but they will win a specially signed 'Golden Pencil Certificate' that will be announced (and presented if you're around?) at our big awards show at the end of the day. So check it out on the website guys and give it your best shot - showing just how 'drawsome' a humble pencil can be! 'Good luck' one and all. The closing date for entries will be as close to the festival as we can make it... at midnight on Wednesday, April 27th, 2016.